Community Counts. Kick Dance makes giving back to the community a priority, encouraging community outreach and community service from its dancers. This fosters students to become great people, on and off the stage. Each year, the studio chooses a charity to work with, and all proceeds from fundraising efforts support that organization. The studio has worked with StrongMom.org, Project Write Now, National Multiple Sclerosis Society, Monmouth Beach Elementary School, All Fur Love Animal Rescue, and Alex’s Lemonade Stand Foundation for Childhood Cancer. Friendship is Forever. Good friends are irreplaceable. Having someone to love, support and get you through the tough times just makes life easier. For children, making new friends comes much more easily when surrounded by other children who have a similar interest. At Kick Dance Studios, students certainly have one thing in common — DANCE! The friendships made during classes and performances are often lifelong ones, and the bonds created make for strong and fluid performances. Technique and Talent. Being a dancer at Kick is about having tons of fun, but it’s also about learning proper technique and form. 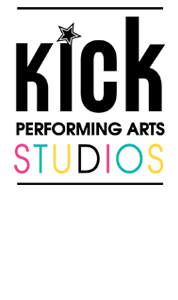 Kick offers a wide variety of Dance, Acro, Musical Theater, and Vocal classes for all ages and abilities. It is our goal to provide the highest quality training while developing a love for the arts. Kick Dancers hone their skills through practice, then show off what they’ve learned at recitals and competitions. Inspiring Instructors. Kick Dance instructors are the heart and soul of what we do. Without them we’d be lost. We have musical theater experts, classically-trained ballet dancers, jazz and tap pros, and even a former Rockette on staff. You can tell these teachers know their stuff, and they have a passion and love for what they do that resonates with each and every student. Their real-life experience translates into life lessons for our dancers. Activities Abound. Kick offers so many different classes it will make your head spin… in a good way. Traditional ballet training is the foundation for all great dancing, and at Kick it’s taught at a quick pace to keep our dancers moving and focused. There are no limits to choreography and expression in our contemporary classes, which blend ballet, jazz, lyrical and modern techniques. Jazz is all about the rhythm, featuring the sounds of the oldies, pop, funk, soul and more. Tap makes our hearts light and happy, and dancers develop rhythm, coordination and balance. Hip hop is high-energy and suitable for all ages. Acro lets dancers tumble and flip, with cartwheels, back bends, walkovers, chest stands, back handsprings, back tucks, layouts and aerials. Trust us, no one is ever bored at Kick! Cultivating Confidence. Our dancers go beyond technique to develop important life skills, learning to be respectful, confident and conscientious young people who share their gifts and talents with the community. We focus on both personal development and teamwork to make our dancers the best the can be. Team Togetherness. We teach dance to make great kids! That’s why our team programs are focused on compassion, teamwork, commitment and life skills. Kick’s competition team allows dancers with a passion for performing the opportunity to showcase their talents. We’ve performed at Walt Disney World, ABC TV, Madison Square Garden and many other places! Team Kick has won numerous awards at both the regional and national levels. Forget Failure. From failure comes learning, and often success. 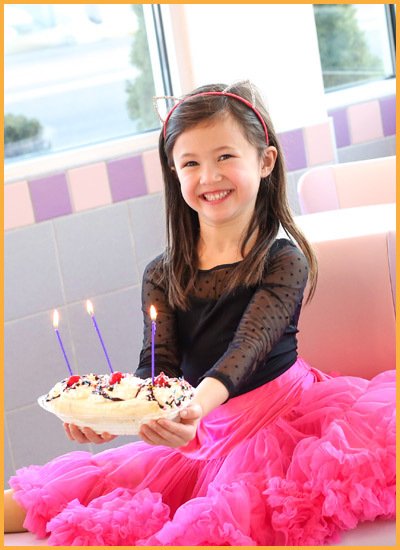 We teach our dancers to practice and try their hardest, all while having fun and making lifelong friendships. Our dancers support their peers and are there to lift them up when times get tough. It’s the Kick Dance way. Mentors Matter. Our instructors become mentors for Kick dancers, and that’s evident in the passion and heart they put into each and every class they teach. Our mentors are dedicated to serving our students, not only in teaching technique, but guiding dancers through life’s challenges and being there, in the good and the bad. Overcome Obstacles. Dance is an excellent outlet for young dancers to put life’s stress behind them and focus on something positive and affirming. Not only does dance provide many health benefits, such as increased flexibility and muscle strength, it also helps improve mental clarity and lowers stress. The dancers at Kick Dance Studios have incredible dedication and can do anything when they put their minds to it! Fostering Fitness. Team sports like soccer, baseball and football keep children in shape and active, but what about when those sports are out of season? Dance provides the ideal activity for children to build strength and stay in shape until they’re ready to play ball again. Many professional athletes attest to the benefits of dancing, like 320-pound Pittsburgh Steelers nose tackle Steve McLendon, who has been taking ballet since his senior year of college as a way to keep himself injury-free, and he attributes dance with strengthening his knees, ankles and feet. Showing Support. When a Kick dancer is down, fellow Kick dancers lift them up and help to rise above any challenge. With supportive students and instructors, Kick dancers can do anything. Students at Kick not only support each other when the going gets tough, they support their community. With so many people in need, Kick is always ready to lend a hand and support the community they so proudly are a part of. Models of Modesty. Kick’s top priority is that kids will be kids. In a world where children grow up too fast, Kick prides itself on age-appropriate music and costumes. We believe in preserving childhood and that children can learn self-respect and love the skin they are in when allowed to be kids. Our program goes above and beyond to encourage positive body image so children can love who they are and feel free to be themselves. We teach and model modesty, teamwork and positive body image. Broadway Bound. Kick teaches dancers to reach for the skies and dream big, that’s why dancer’s interested in ultimately performing on Broadway’s big stage have the opportunity to learn and prepare right in the Kick Dance Studio. We pride ourselves on making our dancers triple threats, because the performer who can sing, dance and act can’t be stopped. Kick’s acting, vocal and musical theater and performance-based classes provide a supportive, non-competitive atmosphere for young dancers to bloom. Kick dancers have had opportunities to see Broadway shows in preview, as well as get up close and personal with a real-life Rockette. These brushes with Broadway are a great way for our dancers to imagine the endless possibilities dancing provides for themselves. 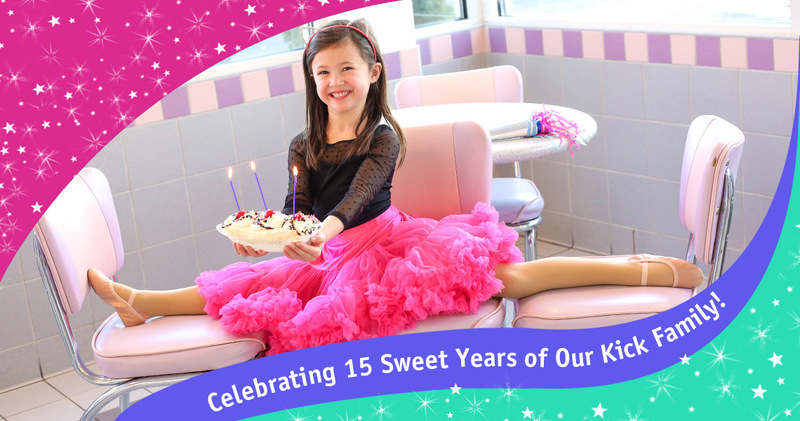 As Kick Dance Studios celebrates its big 15, we’ll be featuring some of our dancers and the personal stories that make them unique. Check out our first dancer profile on Sadie Marino here, and stay tuned for more inspiring dancer stories!